The West Coast capital has long been known as a style hub. Whether looking at fashion on the runway or interior design, Los Angeles trends differ from the East Coast, and have their own look, feel, and personality. Let’s take a peek at five stylish bedrooms in Los Angeles. This LA bedroom takes classic midcentury modern to another level. The bed’s clean lines, textured coverlet, three-dimensional art, and funky pillows create a stylish yet comfortable environment. The pool view isn’t bad either! This Silver Lake bedroom embodies a chic, colorful design, yet manages to keep things simple. 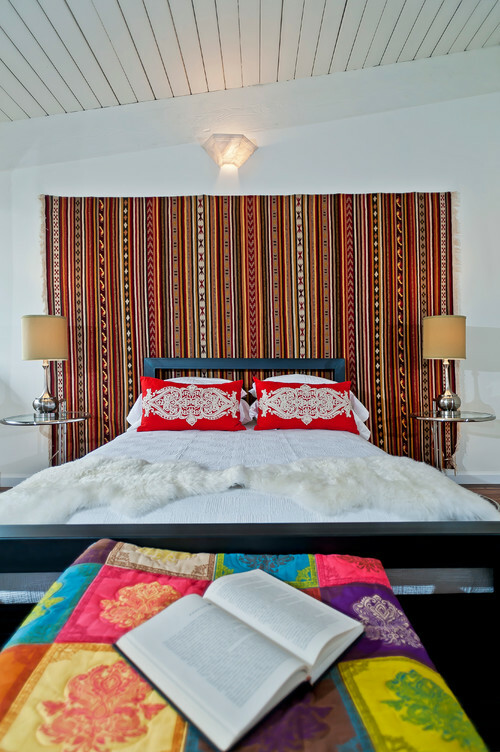 The headboard is understated, but the wall hanging (actually an area rug turned horizontally) makes a statement. 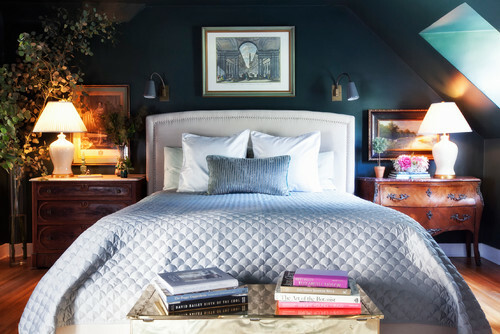 A gorgeous bedroom in the Hollywood Hills takes a risk with black walls but manages to pull it off. Antique furnishings such as a Chinese chest pair well with the linen headboard and matelassé bed covering. Photo by Lindsay Pennington Inc. This neutral bedroom features white walls and furnishings with dark hardwoods and a natural fiber area rug. With so little color in the interior, the room gives the outside view an opportunity to shine. 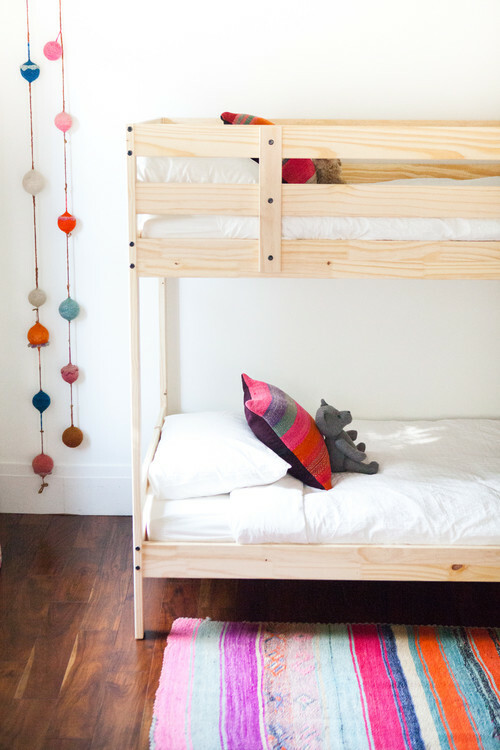 Fun and whimsical, a bedroom in a Spanish style home uses bunk beds to save floor space. The décor keeps the mood light and is ideal for a child’s room. You did a lot of research and paid a lot of money to get the mattress of your dreams. The materials inside your mattress and how its constructed will determine how your mattress holds up. Innerspring mattresses with tempered steel coils will give you better, longer lasting support than layers of all foam. Materials like latex on top of individually pocketed innersprings, will retain better loft and show less body impressions than memory or polyurethane foams. So, try this simple program to avoid those dips and valleys. Research shows it takes 30-60 days for you to get use to your new mattress and for it to get use to you. The chore of flipping your mattress is no longer necessary. You can improve long range performance by rotating your new mattress every quarter for the first year, then once every six months. A rotation is 1 turn of the mattress, putting the head at the foot and the foot at the head of the bed. The reason is physics; most couples are different weight, height and shapes, yet we tend to sleep in the same spot, in the same position(s) night after night. By rotating your mattress you sleep on different sides without actually having to change sides. Once a year its advised to also rotate your foundation or boxspring head to foot. A King or Cal King Set comes with 1 mattress and 2 foundations, you should switch the foundations from one side to the other and rotate each head to foot. Same goes for Split Queen foundations. A simple rotation schedule will even out wear & tear and help you get use to your new mattress more quickly. While all mattresses naturally soften over time and with use, by rotating your mattress and foundations you will get many more years of sleeping well. I’m not a film major; I’ve never been good at “reading” films and analyzing things like framing of shots, lighting, things like that. There’s been a whole lot of talk about this new Netflix series and all the ways it is paying tribute to the classic adventure movies of the 1980s. I haven’t read those yet because I’m horribly afraid of spoilers. But you can feel the nods to such classics as The Goonies and Close Encounters while you watch. As the kids ride frantically through the night on their bikes, you half expect them to start flying à la ET. This is an amazing series and arguably one of the best shows on television right now. The year is 1982 and four boys are playing Dungeons & Dragons in a kid’s garage in Hawkins, Indiana. One of the young boys, Will, leaves for home but never makes it. While searching for their friend in the dark woods, the three remaining boys come across a strange young girl. Maybe it’s a coincidence that she has appeared right when Will disappeared. Maybe it’s not. Meanwhile, Will’s mother (Winona Ryder; another great nod to the 80’s) is convinced she is getting messages from Will, wherever he is. Naturally, most think she’s lost her mind. But has she? Meanwhile, a secret government facility seems to have lost control of a hugely dangerous project. These things never turn out well. The cast of this show is amazing. The three kids on a quest to find their friend are perfect. Awkward and bullied but undeterred thanks to the powerful friendship. Winona Ryder as a mother on the verge of mania trying to figure out what’s happened to her son. And Millie Bobbie Brown, who plays the mostly silent mysterious girl known as Eleven, is incredible. If you haven’t already binge-watched all 8 episodes, tonight is as good a time as any to start. Anyone who loves monsters, mystery, innovative kids, or adolescent drama should be watching this. Photo by Wayne Windham Architect, P.A. Even if you’re not techy, some of the gadgets today might appeal to you. Gadgets are invented to make our lives easier, and we can all use a little help with the way in which live (and sleep), so I say, why not? And some are just plain fun to use too. Here are four high-tech gadgets you might want to purchase for your bedroom. When the weather’s cold, especially, this gadget really comes in handy. Most people like to sleep in a cooler temperature, like 60 or 65 degrees, but then they want a warmer room when they’re ready to get out of bed in the morning. A programmable thermostat will allow you to set the temperature on a timer and your heating and air conditioning will come on at the specified time. Hence, no more waking up in a chilly bedroom. 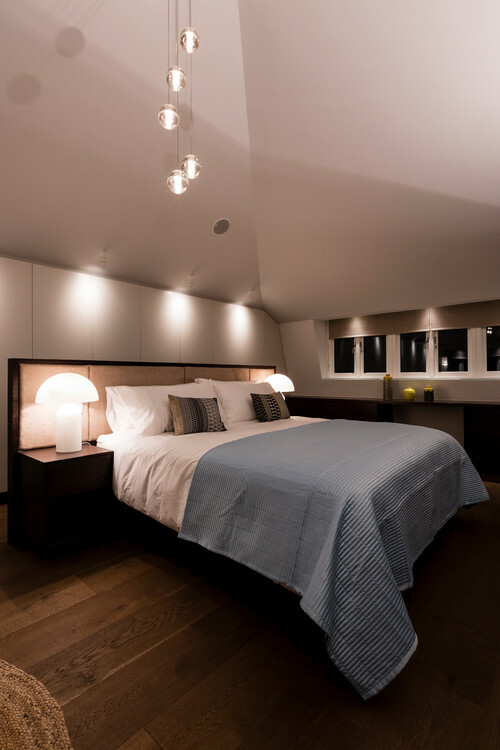 Dimmers will spoil you, especially if they’re Lutron. Not only are these light control gadgets energy savers, but they allow you to get the right amount of light you need at all times. Hate snoozing in a pitch black room and need just a touch of light when you sleep? A dimmer can accommodate. Aromatherapy has been proven to remedy stress, and by adding essential oils to an automatic diffuser, not only will your bedroom smell wonderful, but you’ll feel calmer and might sleep more soundly through the night. Some diffusers also work as humidifiers and air purifiers. Most models come with automatic shut-off. If you’re having a tough time sleeping, a sleep tracker can provide insight as to the quality of your sleep and might even help you improve it. Sleep monitors can tell you how many hours you’ve slept, how long you were restless and which stages of sleep you’ve slept in on a given night, keep track of your heart rate, and more. Legend is a classic 1980s fantasy movie starring a young Tom Cruise. He plays Jack, a young man—possibly a wild child? He definitely hangs with faeries and dwarves—who is in love with a woman named Lili (Mia Sara, better known as Ferris Bueller’s girlfriend). But when he takes her to see the amazing magical unicorns, he’s made a big mistake. For Lili touches one of the beasts and then these goblins come and hack off the unicorn’s horn to bring to their master, Darkness (Tim Curry with a LOT of prosthetics and paint) who will use the power of the horn to lord over the world. So, Jack gets together with his dwarf and faerie friends to go recover the horn and restore order. If you grew up in the 80s and watched this movie, maybe it made a lot of sense to you. I was constantly confused by what was going on. That said, it’s an enormously entertaining movie, partly due to its incredible badness, also due to its liberal use of glitter and the soundtrack by Tangerine Dream. Bear in mind that Ridley Scott made this film and he also cut 52 minutes from the film which may explain some of the confusing transitions. If you have a kid who likes fantasy, or if you haven’t watched this movie since you were a kid, pick up a copy and watch it. Perfect bedtime watching material!